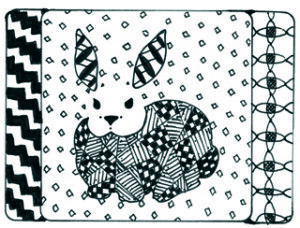 View a YouTube, talented tangle artists share wonderful ideas and projects from the Zentangle Retreat sponsored by Angie Vangalis CZT. In the video I am sharing this week you will see many of the attendees from the CZT Marketing Retreat showcasing some of their talents and also giving us really good ideas on new “tangle projects”, many of them would be perfect for holiday gift giving. Bonnie Pewterbaugh creates beautiful scarves with an ancient art form called Katazomi, a paste resist technique using handmade stencils. Sampada Agarwal has a great idea for turning kitchen hot pads and cup towels into a one of a kind gift set. Many other fabulous ideas are on the video. Zentangle is growing so fast, it is a joy to watch the spread of this phenomenal art form. There are classes, workshops and retreats all over the world. This is Angie’s third annual retreat and a wonderful gathering opportunity for Certified Zentangle Teachers. 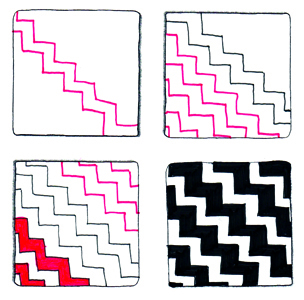 A time for meeting like-minded friends, and sharing ideas, new projects and our love for Zentangle. One of my favorite workshops to teach is tangling on small canvas bags, I taught this at Angie’s retreat. These are so fun to do, I use the Pentel Gel Roller pen for Fabric. 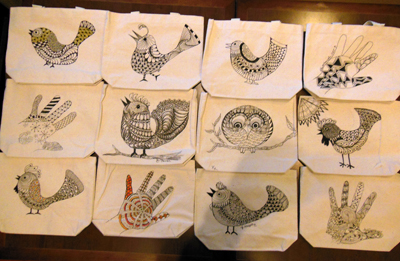 These would be perfect to use as little gift bags for holiday gifts. 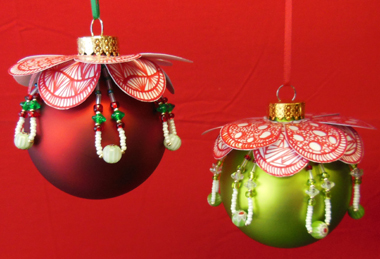 Last year on my blog I featured some extraordinary beaded Christmas ornaments from Susan and Lucie Meeks. There is a YouTube on the Design Originals channel you can review to get you in the mood to create your own “tangled tree”.